Sultan Mahmud Airport (IATA: TGG, ICAO: WMKN) is an airport in Kuala Nerus, Terengganu, Malaysia. 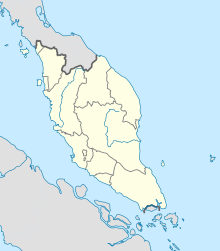 The airport serves Kuala Terengganu which is located 8 km (5.0 mi) away. In 2017, it handled 943,660 passengers with 11,485 aircraft movements. It was named after the 16th Sultan of Terengganu, Almarhum Sultan Mahmud Al-Muktafi Billah Shah Ibni Almarhum Sultan Ismail Nasiruddin Shah, who ruled from 1979 to 1998. In January 2008, the Malaysian government approved RM200 million to upgrade the airport. This includes funding to extend the runway and upgrade the terminal of the airport. The terminal was designed to handle 2 million passengers every year. Malaysia Airlines has agreed with Tabung Haji that it will also bring passengers to Mecca via Jeddah and Medina in Saudi Arabia. On October 11, 2008, a Malaysia Airlines Boeing 747-400 from Kuala Lumpur landed there, the first Boeing 747 to do so. Wikimedia Commons has media related to Sultan Mahmud Airport. This article about a Malaysian airport is a stub. You can help Wikipedia by expanding it. This page was last edited on 13 April 2019, at 20:04 (UTC).